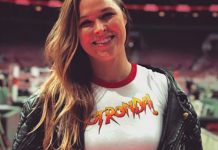 Those who have been following Ronda Rousey’s transition into her next career and were eager to see her in action, finally got their wish last night on WWE RAW. We got a glimpse of her moves during a training session sizzle reel, but RAW showed Rousey’s first proper slam in the ring since her Wrestlemania 31 hip toss on Triple H. She got on the mic, pulled some hair, and roughed up Stephanie McMahon leading to a huge announcement: It’s going to be Kurt Angle and Ronda Rousey versus Triple H and Stephanie McMahon at Wrestlemania 34. 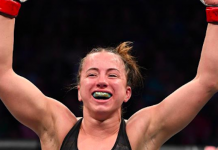 The team of two Olympians going up against WWE’s super couple will serve as the big payoff to a journey that’s been teases even before her friend and former UFC fighter Shayna Baszler competed in the Mae Young Classic. 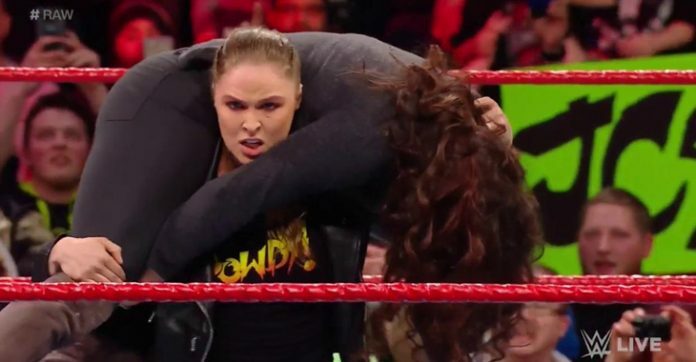 You have to think the major endgame is to have Ronda Rousey truly rip McMahon’s arm out of her socket in the middle of the ring while Kurt Angle disposes of Triple H somewhere. There are four weeks for Rousey to prepare for her match and she’ll be on RAW every Monday hyping up this match until Wrestlemania 34. Wrestlemania 34 will take place on April 8th a day after UFC 223 in New Orleans at the Mercedes-Benz Superdome. Former UFC heavyweight champion is expected to headline the card against Roman Reigns for the WWE Universal championship.